Perhaps the simplest definition of impressionism is "the study of the effect of light on color". Claude Monet , the foremost of French Impressionists, spent most of his artistic career studying color and learning how to express its truth in oil painting. At one point he is quoted as saying, "Color is my daylong obsession, joy, and torment." Claude Monet, Pierre-Auguste Renior and the French Impressionists of the late 1800's broke from the classical painting principles that were the standard of the day and created a new approach to expressing human experience. They incorporated the use of vibrant oil colors that were newly available and, freed from the constraints of dimly lit studios, embarked on painting adventures in natural sunlight. The Impressionists painted life as it existed in the world around them: landscapes in various seasons and light, common scenes of daily life, people wearing the clothing and expressions of the day. As painters they moved away from the use of black and umber and painted what they saw: bright light and shadows of blue, purple and green. Impressionism is the true expression of representational painting, recognizing and using the full color spectrum of nature. Among the other members of the French Impressionist movement were Edgar Degas, Berthe Morisot, Alfred Sisely, Eduard Manet, Camille Pissarro and Gustave Caillebotte. Although not formally a member of the Impressionist "movement", Vincent Van Gogh is considered an impressionist. Claude Monet in particular had a strong impact on American painters. A number of notable examples of American Impressionists are John Singer Sargent, Willard Metcalf and Guy Rose, among others. William Merritt Chase, an American painter and art instructor of the late 1800's in New York City, would take his students to paint and study in Europe. In one of those trips he visited Claude Monet at Giverny and saw his work. Chase began to incorporate this color approach in his teaching. One of his students, Charles Hawthorne, was deeply impressed by the truth expressed in French Impressionism and founded the Cape Cod School of Art, (now known as Cape School of Art) in 1898 at Provincetown MA to teach it. From this, a uniquely American brand of impressionism developed. Henry Hensche, one of Hawthorne's students, continued Hawthorne's work at the school and over a span of 40 years refined Hawthorne's methods and taught art students from all over the United States, developing a unique painting technique to help artists see and express "the truth" of color. These techniques continue today among Hensche's many students. This is an interesting video describing the history of painting, French Impressionism, and how it provides the context for the work and teaching of Henry Hensche. It's taken from an older 16mm film and the sound and images can be a little difficult to pick up at times, but it can be very useful in understanding our color approach to painting. Many thanks to Phillip St. John, another of Hensche's students, for preserving this film and making it available on Youtube. So, what is it like to paint "en plein air" today? It means taking your easel and paints to wherever the action is. Recently, I had the opportunity to paint in New York City. I wanted to paint the scene of a busy street, mostly just for fun. It was a great experience. 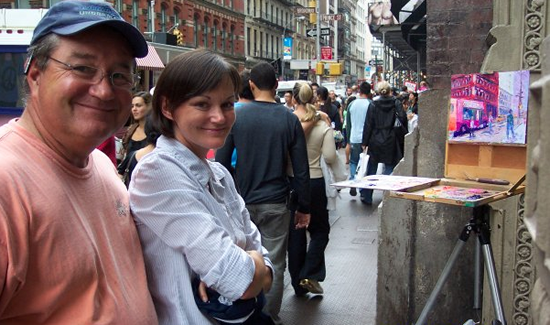 Standing with my daughter, Erin, after a morning of painting along busy Houston St. in New York's SOHO district. Lots of conversation with passersby. I sold this painting wet on the easel to a lady working in the van behind me! San Giorgio Maggiore at Dusk is a prime example of Monet's work. Occasionally referred to as Dusk in Venice or Sunset in Venice , it was painted in the autumn of 1908 in Venice where Monet and his wife Alice were visiting. They stayed first at the Palazzo Barbaro and later at the Hotel Brittania. It was here that he created this masterpiece. It was during this time he began losing his eyesight from gray cataracts. Much like many other painters who were afflicted with pain or disease, suffering seemed to provoke him to do his greatest work. The vibrant blue, yellow, and red colors were used by Monet to depict the sunset. Across the lagoon we see San Giorgio Maggiore, a famous island church in Venice, Italy. 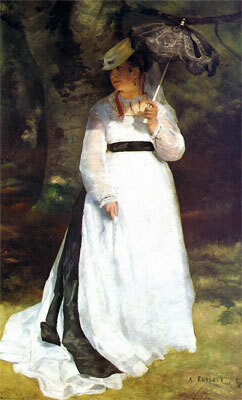 Lise With A Parasol, painted in 1867, was Renoir's first significant critical success, admired at the Paris Salon in 1868. The model is Lise Tréhot aged about 20. Tréhot was Renoir's mistress from about 1865 to 1871. He painted her at least 17 times, including Lise With A Parasol . 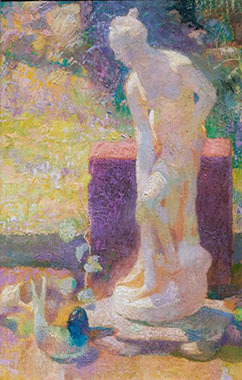 Study: Statue in Light, is a color study by Henry Hensche painted with a pallet knife. Hensche's ability to capture "the effect of light on color" was notable. His technique for teaching both color awareness and color mixing to accurately portray the "light key" affecting an object or scene in natural light was a unique contribution to impressionism.